You've been looking at your old bathroom for years-deciding whether you should take on the bathroom remodeling yourself-but you may not be sure where to start. 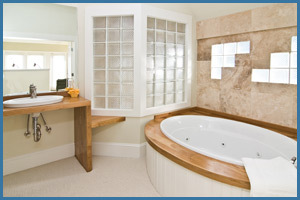 That's when you should call Trinity Construction and Development-a team of highly skilled bathroom contractors. Our advice: Don't attack your bathroom remodeling project on your own! We have been called a "jack of all trades" because as bathroom contractors, we've seen it all, and have been able to respond to whatever bathroom remodeling challenges that come our way-from electrical to tile to finish carpentry work. Sometimes you just don't know what will happen at the onset of your bathroom remodeling project when you take down that first wall. No worries-as your bathroom contractors, we will respond and take care of every problem! Regardless of what issues we may encounter during a bathroom remodeling project, even if there aren't any at all, in the end, homeowners have a sparkling new bathroom, and we have another satisfied customer who took advantage our expertise as bathroom contractors. Remember, not every project requires a complete bathroom remodel. Perhaps your bathroom remodeling project only requires a new tile floor and updated fixtures- Or maybe you're ready to finally create that home spa you've always dreamed about-let Trinity bring your bathroom remodeling vision to life. The next step-you hire us as your bathroom remodeler, and it puts you one step closer to having that beautiful new bathroom. 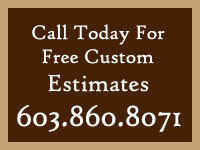 Still wondering why homeowners refer Trinity's bathroom remodeling contractor services to others? At Trinity we want the entire bathroom remodeling experience to provide you with a peace of mind knowing that we will deliver nothing but excellence. And we invite you to call us for a free custom quote to learn more about the range of services we offer as bathroom contractors at 603.860.8071.